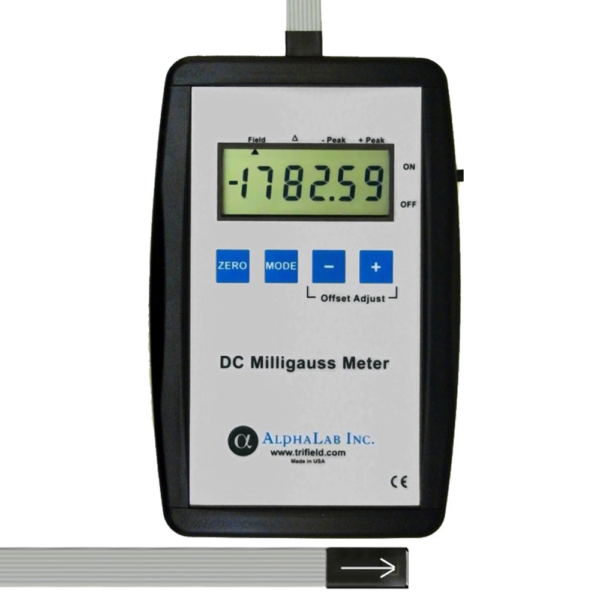 DC Milligauss Meter Model MGM - AlphaLab, Inc.
An improvement on the flux gate magnetometer, the DC Milligauss Meter measures magnetic fields (technically “flux density”) up to several times the strength of the Earth field. It has a resolution of 0.01 milligauss (1 nanotesla) and a range of +/-2000 milligauss (200 microteslas). 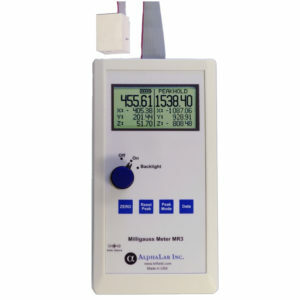 The meter’s magnetoresistive sensor is a major improvement over an uncompensated fluxgate magnetometer both in cost and stability. In fact, this sensor approaches a proton precession magnetometer in temperature stability. However, at only 1 mm x 0.2 mm, the active sensor area is much smaller than fluxgate magnetometer or proton sensors. This allows very precise magnetic measurements in small areas (such as thin films) or with high gradients, when necessary. 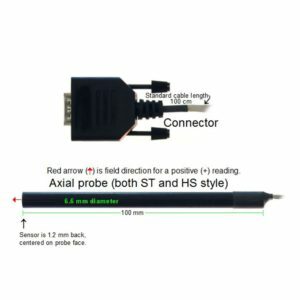 1/8″ Mono phone jack can be used with a data acquisition system such as Data Logger USB-DL1 with AlphaApp. The outputs are an analog voltage, with 1 Volt = 1 Gauss ±0.5%. Range is ±2 gauss (= ±2V). Normally, it is a “slow-moving” DC voltage (Valid DC to 3 Hz), but a higher bandwidth can be ordered (DC to 300 Hz at the 3 dB point). The display is 5 1/2 digits, which reads from -1999.99 to +1999.99 milligauss, with resolution 0.01 milligauss over the entire range. (Compare to the Earth field, which is on the order of 500 milligauss). Update is three times per second. 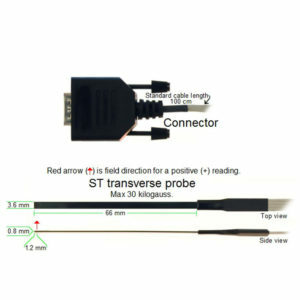 The sensor is at the end of an eight-wire cable that is normally four feet long, but other custom lengths are available. The sensor is “axial”, which means it detects the component of the field that’s in the same direction as the cable points (see arrow photo). The meter reads negative when the sensor is pointing toward the south pole of a magnet and positive toward north. The small active area of the sensor is in the center of the dark square. At fixed temperature, reproducibility is +/- 0.01 milligauss (1 nT) and the temperature coefficient of the offset is less than 0.01 milligauss/°C. The temperature coefficient for gain is less than .0015%/°C. 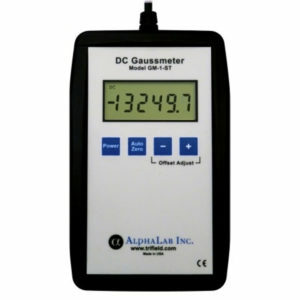 As shipped, gain accuracy is +/-0.5% and the meter offset is +/- 0.5 milligauss. All specifications are at temperatures 0 to 45°C. Size is approximately 18(high) x 9(wide) x 5(thick) cm. Weight, including battery is 325 grams. See photo for the external sensor dimensions.